Heartburn (or GERD): When Do I See My Doctor? Heartburn can lead to serious conditions and should not go untreated. 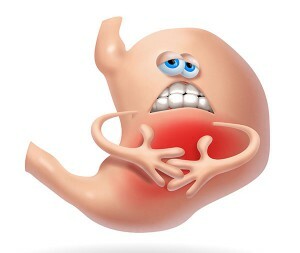 Heartburn, acid reflux and indigestion are all interchangeable words describing acid entering the esophagus and causing a burning sensation or pain. Another commonly used term for heartburn is GERD which stands for gastro esophageal reflux disease. The symptoms are usually very distressing and result in taking something such as an over-the-counter antacid to relieve the symptoms, but not all heartburn is alike. Some people describe belching, chest pain or even sinus symptoms. A sore tongue or bitter taste in the mouth can also be symptoms of heartburn. How do I prevent heartburn? The most important factor in the prevention of heartburn or GERD is dietary modification. Being overweight is frequently associated with heartburn. Eating a meal within two hours of bedtime will frequently produce heartburn, especially if the meal was large or included spicy foods, high fat content foods, or carbohydrates. Alcohol intake and coffee are also associated with heartburn. So prevention is to limit these factors and drink plenty of water. Water creates more saliva which is a natural antacid. If the dietary changes fail, then over-the-counter medicines are the next step. There are many over-the-counter medicines that are very effective to control heartburn. Even prescription doses of Prilosec are now available and are very effective at controlling heartburn; however, it is important to note that many of these medications are not designed to take long-term, so be certain to read and follow label instructions. In contrast, long-term use may be needed and should be monitored by a physician. So the burning question is when should I see my doctor? If diet and medications have not resulted in relief of the symptoms, it may be time to talk to your doctor or other health care professional and seek professional help. If you have experienced long-standing heartburn, there is a risk of developing cancer of the esophagus. Esophageal cancer can be prevented by new procedures available to reverse the damage of gastroesophageal reflux. Dr. Gary M. Annunziata is board certified in Internal Medicine and Gastroenterology and can be reached at Desert Gastroenterology Consultants (760) 321.2500. www.desertgastro.net. He is also a member of Desert Valley Independent Physicians www.DesertDoctors.org; (760) 232.4646.